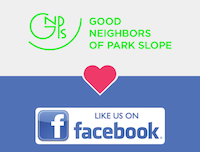 Good Neighbors of Park Slope (GNPS) is an all volunteer, non-profit, aging-in-place organization, open to residents of Park Slope and surrounding areas who are age 50 and over. Our goal is to create a network of members to make life in our neighborhood easier and more fulfilling, while maintaining our autonomy and quality of life in our homes. You must be a member & login to see this page! This group now has 218 members. Add your name to this list if you are interested in receiving information about Social Activism Events happening in our area. Please email us if you would like more information about promoting your activism event. We are happy to report that the “downpayment” project for an elevator at 7th Ave did win in this years Participatory Budgeting, which means that Councilman Lander will be matching that $250,000 with another $250,000. Thank you for your votes. This project is a long way down the road, but helps to keep us on the list of the next 50 subway stations to be made accessible. Because Sharon Montoya is recovering from an injury at a rehab center, she has not been able to come to our knitting circle, so the knitting circle decided to come to her! Here are (from left) Sharon, Daria Rigney, Jasmine Melzer, Carol deBeer, Louise Spain and Joyce Jed. 50th Anniversary Celebration of the Woodstock Event! If you would like to join in our activities and have access to all our information, consider becoming a member -- click on our Membership page for more information.